Bonneville Salt Flats, Utah, USA, September 3, 2011-----American superbike rider and electric vehicle pioneer Chip Yates and team electrical engineer Robert Ussery have written the final chapter of the SWIGZ.COM Electric Superbike in thrilling fashion on the legendary Bonneville Salt Flats. In the last official event of SWIGZ.COM Pro Racing USA’s 2011 electric racing and technology demonstration campaign that has seen success in WERA Motorcycle Roadracing, the Mojave Mile Shootout, Fastrack Riders Auto Club Speedway, and the Pikes Peak International Hill Climb, Chip Yates and his all-volunteer team have claimed four Official FIM World Records as well as four official AMA National land speed records in their rookie attempt at land speed racing. Overcoming a variety of obstacles including a chain breaking at 173mph, underperforming lithium-ion batteries, a half-day of canceled racing for high winds, incomplete battery pack recharges from the strict 2-hour FIM turnaround rules, and a head-on collision at over 150mph with a mile marker that broke Chip’s helmet, windshield and fairings, the SWIGZ.COM Bonneville Team of Robert Ussery, Jason Fairclough, Andrew Roberts, and Randy Hall regrouped to deliver a nearly impossible result. The SWIGZ Team went into the BUB Motorcycle Speed Trials with the objective of beating the top speeds set by Lightning Motorcycles during the recent S.C.T.A. Speed Week event in addition to attempting to set four Official FIM World Records. But after some early test runs revealed problems with battery performance, the mission was changed to solely focus on trying to set the Official FIM and AMA Records. Chip and the team have not yet publicly announced their next move, but will continue to cheer on the other top electric motorcycle teams such as Mission Motors, Lightning Motorcycles, Brammo, Zero Motorcycles, MotoCzysz, KillaCycle, and Roehr as these companies carry the ball forward in advancing the technology and public perceptions of electric powertrain technology. Orange County, California, August 12, 2011-----American superbike rider and electric vehicle pioneer Chip Yates has entered the SWIGZ.COM Electric Superbike in its last official event of the team’s 2011 racing and technology demonstration campaign that has seen success in WERA Motorcycle Roadracing, the Mojave Mile Shootout, Fastrack Riders Auto Club Speedway, and the Pikes Peak International Hill Climb. Yates will be attempting to set official FIM World Records on the Bonneville Salt Flats in Utah during race week, weather permitting. In the event of bad weather or catastrophic technical problems, the team will consider entering another, similar event to demonstrate top speed before retiring the superbike from active competition. Chip’s all-volunteer team has been busy preparing for this special event. Key race engineer and electrical guru Robert Ussery will lead the SWIGZ.COM Pro Racing USA team on the salt during race week. In preparation for the FIM high-speed record attempts, Chief Engineer Ben Ingram has made a number of changes to the superbike including aerodynamic enhancements, wheelbase extension, and power. 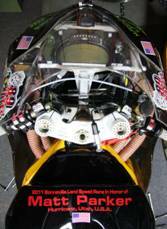 Working together with UQM Technologies (www.uqm.com), the output of the liquid-cooled PowerPhase electric motor has been raised to an incredible 258 horsepower, an increase of 18 hp over Chip’s record-setting Pikes Peak bike. The team’s Bonneville entry and record attempting runs are being done in memory of Matthew Parker, a 14-year-old Utah native who tragically lost his life July 28th on LakePowell. Matthew is the nephew of Chip’s manufacturing leader, Chris Parker, owner of CPR Fabrications of Costa Mesa, California. Chip will carry special red decals on the tank and lower fairings to honor Matt, in addition to carrying the team’s American flag during the high speed runs, which will be presented to Matthew’s parents, Mike Parker and Denise Combs Parker in Hurricane, Utah immediately after the race week. Facebook pages entitled “Remembering Matthew Parker” and “The Matthew Parker Project” have been established to honor his memory and the public is encouraged to visit and “Like” these wonderful tribute pages.